Kurtis Drummond played free safety for the Michigan State Spartans. He earned the Big Ten Defensive Back of the Year and was named as a 3rd team All-American in 2014 when he posted 72 tackles, 15 passes defended, and 4 picks as a senior. With NFL caliber speed and some tools to work with especially his vertical jump, Kurtis was truly an enigma to scouts who couldn’t come to a consensus Drummond’s shortcomings. A true student of the game at MSU, Drummond was nicknamed ‘The Matrix’ by Spartans’ DB coach Harlon Barnett, for Kurtis’ ability to quickly assimilate game film and apply it on the field. 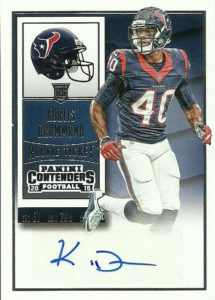 Initially projected to go in round 4, Kurtis landed with the Houston Texans in free agency instead. It was probably best for Kurtis as the Texans have a knack for patiently developing defensive backfield talent (AJ Bouye, Andre Hal). Drummond did see some playing time on the field in 2015 on special teams recording 4 tackles and a forced fumble. He’d be shelved on IR for the entirety of the 2016 campaign. Entering the 2017 season, Kurtis is ranked 3rd on the Texans depth chart for playing time behind Andre Hal and Corey Moore at free safety.